thank you for your very kind words. I was thinking about that post for awhile. Blogging gives such great perspective on reality as it is happening. Your photos are wonderful. I love your moon photo and the happy shot of your daughter. I also love smooth river stones. The knocks of nature turning into beauty that nestles in the hand. 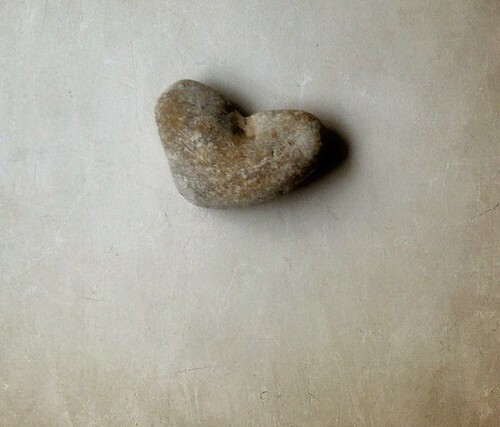 Lucky you to have found such a perfectly shaped stone. 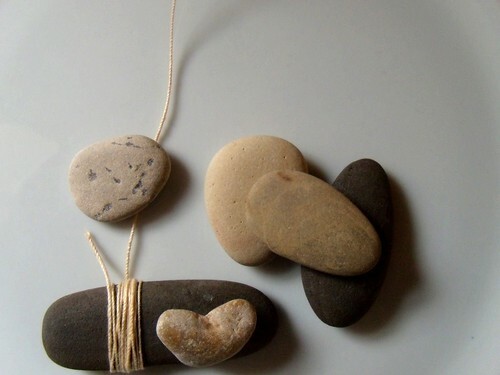 Love what you've created out of these ordinary 'rocks'. Terrific! We are a rock collecting family, so I know those heart shaped ones don't come by everyday. Lovely. 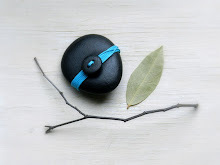 Enjoyed this stone and paper meditation! I have a basket full of all the beautiful rocks I've collected over the years. I don't think I've ever found a heart shaped one. 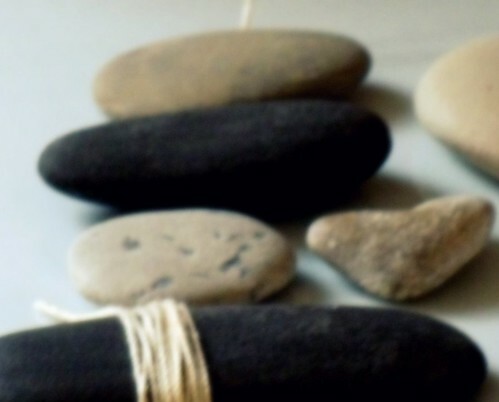 these are beautiful - the river rocks make a peaceful and serene backdrop to your craft. there is just something about holding a smooth rock in your hand, isn't there? oh my goodness this is a wonderful collection you have. i it's funny how certain rocks just catch your eye. i brought back 4 rocks from AZ and was so afraid they were going to take them from me in baggage check. how do you do it? see love, always, in the every-day? you had me at the first stone! those pictures are beautiful. I love how God can speak to you through the humblest of things. My hand is resting on my heart, reading your words, viewing your images...and my heart and hand feel very happy! I love organizing stones! The one you found is perfect for your aesthetic. I love this...I want to make a song rock. 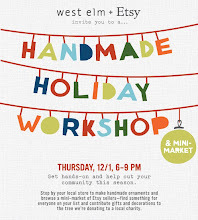 What nice little handmade gifts those would be. What a perfect heart! 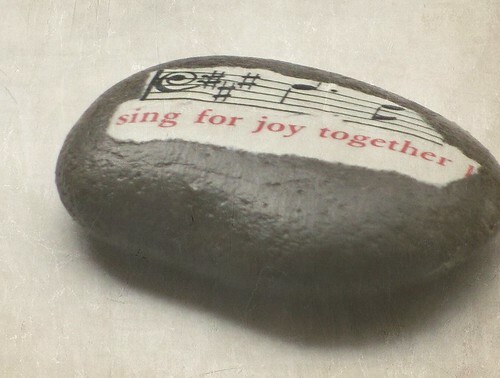 And I love the idea (and implementation) of singing rocks .. seems so appropriate somehow. I love the heart rock. It actually made me gasp out loud. A collector of rocks myself. The best place on the planet to find them are in Marathon Ontario's, Pebble Beach. But don't get caught, there are signs not to take any rocks. I have a ever growing collections of stones - my son always bring me some from his walks with Dad. We fill up a jar, put them in the back yard and start over. One I'll keep forever - the one he reminded me, "say thank you!" I love stones; they ground me. I often carry them around with me, rubbing them for peace and comfort. Your stones are beautiful! even your flickr stream is delightful! love the images, beautiful... and yes, grounding. Oh, how cool, how soothing! Thanks. so glad you linked this, friend. i love your tender heart. over from emily's and i love this in so many unexpressable ways!!! i loved a woman who loved stones and she taught me to find my own stones. they are good for remembering. love love love this heart shaped gift. always he reaches us in nature. Oh, how I love found hearts! Lovely. I finally blogged about what our family is going through. We need all of the prayers we can get. such beauty in something so... daily. Thank you for reminding us of the exquisiteness of this little bit of creation. 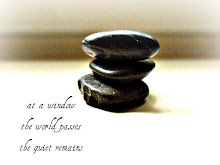 what a peaceful blog - i will visit here when i'm having a little cup of tea and need to find some quiet! thanks for sharing, glad i found you! that first rock, how lovely. it looks like one of your little birds, to me. isn't it just wonderful when we are surprised by joy in this way? Perfect for Share the Joy Thursday, so I've linked you. lovely heart shaped stone! Are you the one with the collection? Some blogger has a bowl full of heart shaped stones! as always, perfect peace and balance.